Afro Samurai (voiced by Academy Award nominated Samuel L. Jackson) is an epic tale of a black samurai's hunt for Justice (voiced by Ron Perlman: Hellboy, Alien Resurrection) who murdered his father. With music score by the RZA (aka Wu Tang Clan) (Kill Bill), Afro Samurai blends traditional Japanese culture, funky technology and hip hop to create a brutally fresh entertainment experience. Special Features In The Booth - Voice Talent of ..
Afro Samurai (Academy Award nominee Samuel L. Jackson) avenged his father and found a life of peace. But the legendary master is forced back into the game by a beautiful and deadly woman from his past. The sparks of violence dropped along Afro's bloody path now burn out of control - and nowhere are the flames of hatred more intense than in the eyes of Sio (Lucy Liu - Kill Bill). There's no such thing as final vengeance. Featuring the vo..
Afro Samurai. A relentless brother wielding an ice cold soul and a jones for revenge. His path is long and violent, and the entire journey so far is now yours to witness. 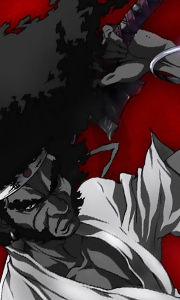 First, the legendary series - Afro Samurai. As a kid, he saw his father slaughtered. Now a man, Afro walks to the mountain where destiny waits on high. The perpetrators must atone, and they're gonna get what they deserve. Nothing Personal - It's Just Revenge. The saga ..
Own Afro Samurai - Resurrection - Directors Cut DVD from Deff, DVD, Blu-Ray & 4K Video Specialists - Free UK Delivery..
Own Afro Samurai Season 1 - Directors Cut DVD from Deff, DVD, Blu-Ray & 4K Video Specialists - Free UK Delivery..